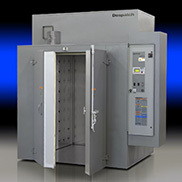 Manufacturers trust Despatch ovens to deliver the uniform and repeatable thermal processing required for critical components to operate flawlessly and ensure reliable product performance. 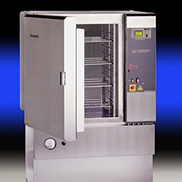 Despatch never cuts corners, ovens are manufactured to the highest standards and deliver invariable, uniform temperature for as long as the oven is in service. 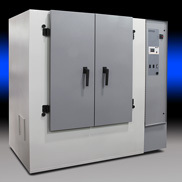 Minneapolis, Minn., U.S.A. – January 31, 2012 - Despatch Industries, the world’s leading thermal processing equipment provider for over one hundred years, announces the new Protocol 3™ temperature and process controller. Protocol 3™ is a microprocessor-based temperature and hi-limit controller designed to enhance process visibility and make oven operation simple and flexible. The advanced controller incorporates many new features that reduce set-up time, simplify operation and minimize downtime. Protocol 3™ is Despatch’s latest upgrade to its controller offering, replacing the Protocol Plus™. Protocol 3™ provides the same standard features and three operating modes as the previous controller, but presents several innovative advancements. The new controller has integrated data logging capabilities that allow users to obtain historic process data for analysis and reporting. Also new to the Protocol 3™ platform are a USB port for simple configuration set-up and export of data files; a large, easy-to-read backlit LCD display for improved visibility; and a multi-language option. The Protocol 3™ offers standard hi-limit control, built in real-time clock, password protection of configuration parameters and five output relays that signal user-specified events to external alarm devices. Users have the option of utilizing Modbus or Ethernet communications for remote start and programming capabilities through a personal computer and the option to purchase Despatch’s Protocol Manager™ monitoring and data acquisition software that enables communication between the oven controller and a personal computer. Despatch has specialized in thermal processing for over 100 years and is actively using this technical expertise to provide innovative solutions to critical applications in a broad range of markets and cutting edge technology worldwide. Minneapolis, Minn., U.S.A. – January 20, 2012 - Despatch Industries, a leading technology and equipment provider for the solar industry, was recently featured in PC Control magazine, a global publication focused on automation technology that is written and distributed by Beckhoff. Beckhoff is a leading manufacturer of PC-based automation components and systems. The article in PC Control discusses how Despatch has changed the control of its market-leading CF Series firing furnaces to a PC-based control platform from Beckhoff and the performance improvements the company has seen as a result. Follow this link to read the full article. 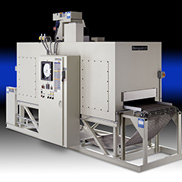 Despatch has specialized in thermal processing for over 100 years. The company is actively using this technical expertise to provide innovative solutions and high performance products to the thermal, solar and carbon fiber markets. The company’s regional offices and complete global service network allow Despatch to provide local sales and product support to all customers worldwide. Despatch equipment is consistently recognized for exceptional performance and process quality, maximum uptime and reduced operating costs. 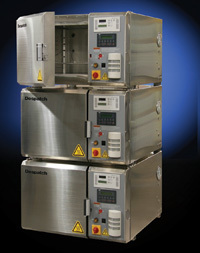 Minneapolis, Minn., U.S.A. – December 16, 2011 - Despatch Industries, the world’s leading thermal processing equipment provider for over one hundred years, reports that the company has seen a strong increase in orders for its LCC clean process benchtop ovens. The orders have come from customers in a variety of industries, including semiconductor, healthcare and electronic components. 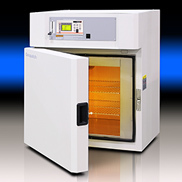 Despatch’s line of LCC clean process benchtop ovens features standard HEPA filter, stainless steel interior and exterior and the Protocol Plus™ programmable control system. LCC ovens are available in air or nitrogen atmosphere conditions and with maximum temperature capabilities of 260°C (500°F) or 350°C (662°F). Additional oven options include silicone-free construction, an oxygen concentration monitor system, chart recorders and end-of-cycle and high-limit audible and visual alarms. LCC ovens can also be stacked to maximize floor space. 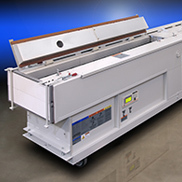 Minneapolis, Minn., U.S.A. – November 17, 2011 - Despatch Industries, the world’s leading thermal processing equipment provider for over one hundred years, announces that the company has sold a custom, high temperature conveyor oven. The oven will be utilized for stress relieving titanium bars that are used in a variety of markets, from medical implants to construction to sporting equipment. 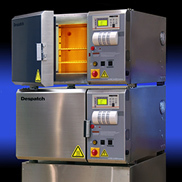 Despatch’s PC Series ovens are designed to maximize production capacity and optimize floor space. 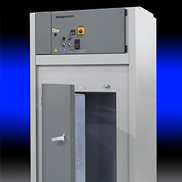 This modified, high-temperature (1100°F) conveyor oven features a wider width chamber and customized stainless steel high temperature belt and all stainless steel interior. Additional options for the PC Series include Class A capabilities, adding multiple heating and cooling zones, variable conveyor speeds and clean environment air filtration including HEPA filters.